As the seasons change and the leaves begin to fall, another season begins – the season of food. Thanksgiving eats, Halloween sweets and Christmas treats are no doubt going to provide much temptation over the next few months. It is often hard to go a few hours without some sustenance, especially during a stressful day when cravings are calling you – at Kalev Fitness we are all about good food – eating right and snacking is no different! Having food throughout the day maintains your metabolic function and decreases that dreaded afternoon fatigue, however, many people choose indulgent snacks which rival the caloric and fat content of full meals! 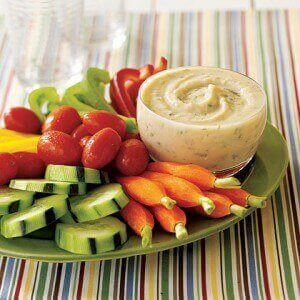 Try for snacks that are less than 200 calories and generally low in fat. Plan ahead – studies show that people who pack their snacks in advance are far less likely to overindulge, choose healthier options and save money. Choose snacks with the idea that they will keep you going until your next meal, not as a pre-meal or simply as a treat. 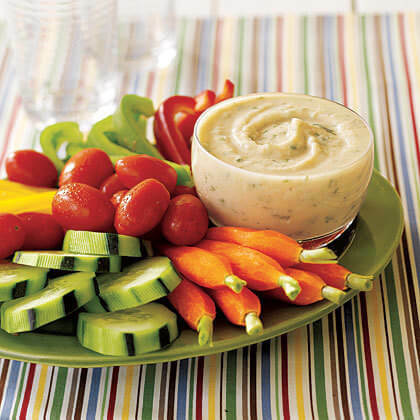 One of my favourite go-to snacks has to be veggies and hummus – I love edamame hummus (you can get it at any health foods/grocery store). Mix up your veggies – the more colour the better, and choose enough of a variety that you are satisfied. Veggies aren’t just good for your weight, they have other benefits as well! Broccoli contains sulphur, which helps repair tissue and elasticity in your face keeping your skin smooth and healthy. Carrots are high in beta-carotene, which helps keep your skin hydrated and more importantly, defends your system against cancer and aging! If you really want a treat in your afternoon and your appetite yearns for some chocolate, go for it! Don’t deny yourself something you really want – but remember, dark chocolate is a far better option, and keep everything in moderation. Also remember that fruit is a great untapped resource for water – both refreshing, and good for you. If you find yourself snack-less and hungry, grabbing some fruit or veggies at a nearby grocery store, or even choosing the healthy vending machine option is always better in the long run. Most vending machines carry granola bars and healthy alternatives to candy bars and chips – use that as an opportunity to make a good choice, and snack sans guilt! Also keep in mind that thirst is often masked by hunger – research has proven that when your body is dehydrated your hunger hormones go into a confused overdrive, making you feel starved for food, when in reality it is for water. Be sure to drink fluids throughout the day not only to hydrate, but also to help you feel fuller, longer! To kick start your snacking success, here are 2 snacking ideas that are definitely worth a try! Your choice of crackers, veggies or whatever you prefer with your salsa! Season the mix with a pinch of salt. Hint for those who like a little spice: try it with tobasco sauce! In a small bowl combine yogurt, 3 tablespoons honey, and zest; set aside. Using the large holes of a box grater, grate the ginger (no need to peel) into a small bowl. Squeeze ginger through a fine-meshed sieve or strainer placed over a medium bowl to get a total of 1 tablespoon ginger juice. Discard pulp. To the bowl with the juice, add remaining 2 tablespoons honey and lemon juice; whisk to combine. 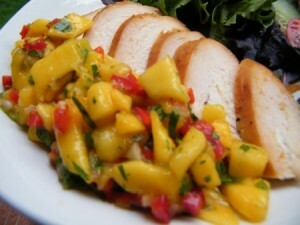 Add papaya, blackberries, and raspberries and toss gently to coat. To serve: Spoon half the fruit and juices among six 8-ounce tall glasses. Sprinkle chopped mint over the fruit. Top with half the yogurt mixture and half the granola. 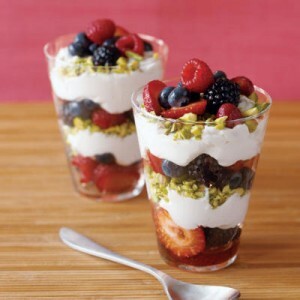 Layer with the remaining fruit, yogurt, and granola. When it comes to fitness and nutrition, they go hand in hand as one idea – Fitness Nutrition will help you to push through your day, your workout and provide fuel for the fire. –For more snacking ideas to have at your workplace or home, here are some additional ideas I liked from Best Health Magazine!